Beautiful and clean 1-bedroom vacation condo in South Kihei Maui. Kihei Kai Nani complex is directly across the street from Kamaole Beach 2. Our unit is located in Building 8. Walk to restaurants, shopping and beach fun activities. Sleeps 2-4; Cal King bed and Queen sofa bed plus 2 comfy recliner chairs. In-suite washer/dryer; air conditioner. 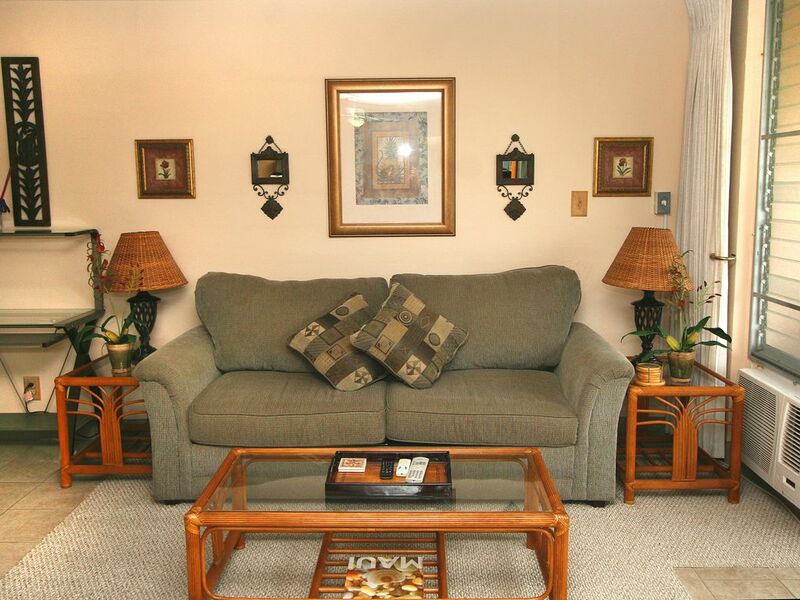 Free parking, cable TV and Wi-Fi internet and Tommy Bahama beach chairs with storage and cooler at the back. Free calls to Canada and within the US. Awaiting you are golden sands, lush tropical gardens, biking and hiking trails, Luaus, romantic sunsets, waterfalls, variety of birds, snorkeling right off the beach with colorful fishes and even turtles! You may even spot humpback whales with their calves during whale season. Shopping, golfing, groceries, restaurants all nearby or within walking distance. On site we have a clean 30 x 60 pool, admin office, security and a covered gazebo for entertaining and shuffleboard. Our deluxe ground floor unit #162 has beautiful garden views and even a glimpse of Haleakala. You will instantly feel at home as you enter the unit. Hallway : Reception table for your convenience, a glass computer center, wireless Bluetooth speakers, in-suite Washer & Dryer; digital safe for your valuables. Bedroom : California-King bed with memory foam mattress topper, beautiful linens, bedside towers with reading lamps and clock, tropical ceiling fan with remote, 32' TV and bamboo dresser, double closets, and tower floor fan. Bathroom : Renovated tile floors and walk in shower, linens, large vanity with granite counter tops and storage, hair dryers, curling iron, lotions and even a first aid kit. Kitchen : Well stocked with refrigerator with ice maker, microwave, stove, dishwasher, counter top appliances, rice cooker, blender, coffee maker, dishes, cutlery, glassware, cookware and even spices for your cooking pleasure. Living and Dining room : 14,700 BTU Air Conditioner, which although located in the living room, extends cool comfort to the bedroom; 4-seater dining table and 2 recliners to sit back and relax with a good book or a glass of wine; pull out Queen Sofa bed with memory foam mattress topper and two large drawers in entertainment unit for clothing storage. The top drawer has DVDs, Music CDs, playing cards, dice and board games, binoculars, Road to Hana CDs and guide books of Maui. Lanai: Tiled lanai, pull-down blinds and storage cabinet with boogie boards, coolers, beach chairs, mats and umbrellas, beach toys for the kids and the young at heart. We also added Tommy Bahama beach chairs with storage and cooler at the back so you can relax all day at the beach in style. What are you waiting for? Come and experience the beauty of Hawaii and enjoy this tropical paradise. You too will be enticed back again and again whether it's for your wedding, honeymoon, anniversary, birthday, romantic getaway, family vacation or just to get away from it all. Check out our availability calendar to book your Maui vacation now! Maui is one of our top vacation destinations. We love the beach and water adventures like snorkeling, scuba diving, swimming, paddle boarding, learning how to surf or simply relaxing and sunbathing. We ourselves have been coming to Maui for many years and enjoyed it so much, we bought our own condo in March 2014! Our last trip has been a blast as we watch tons of humpback whales with their calves (during whale season). We can't wait to go back in the islands again! Please scroll through the 'Guestbook comments from owner' below for great reviews/feedback from people who stayed in our condo (with the previous owner). Location, location, location! We have been to Maui several times and we would always choose Kihei as our 'home base'. We have stayed at other units in Kihei Kai Nani before and and we love how it is steps from Kamaole Beach 2, restaurants, shops and all fun water adventures! Steps from the beach, yet tranquil and away from foot or vehicle traffic so you can be busy in the day and relax at night. Kihei Kai Nani complex is just across the street from the beach! It's really our beach paradise home! Thanks for the great review. Hope to have you back, mahalo! Clean, tidy unit in an excellent location yet very quiet and private. We enjoyed the lanai, walking to restaurants and the ocean. It was also great to have beach chairs available to use! Thank you! We try our best to keep the unit clean and tidy and we are thankful for guests like you who treat the unit as their own and help us keep it that way. Mahalo and hope to have you again. We spent over a week in this unit. It's very clean and really well equipped. The location is perfect. I highly recommend this unit if you plan on being in Kihei. Location, location, location! We can't ask for anything better, being able to walk to a lot of stores, restaurants and of course the beach. Loved to hear you enjoyed your week stay and hope you can stay longer in the future. Mahalo! Congratulations again on your 25th anniversary and mahalo for the great review. We hope you get to celebrate every anniversary on Maui. Our home is always open for your return. Mahalo! Stayed for two weeks in October and it was very nice. Weather has cooled a bit by then and the A/C in the living room works well. USed the fans for the bedroom at back of unit. Washer and dryer convenient and beach is just a short walk away. Nice and quiet at the back of the complex. No little kids this time of year and lots of retirees so the complex was extra quiet. Unit is clean and the staples provided cuts cost a bit. Thanks for staying with us again, Theresa! Everything in the condo is for guests to use, so we're glad you made the most out of the A/C, fan, washer/dryer and a whole lot of extras. See you again next time, mahalo! The place is very well stocked close to the beach and in a quiet area of the complex. Thank you Kathy to staying with us again. We love having return guests esp. like you who were one of our first guests. Mahalo!